Brain metastases from breast cancer are frequently managed with brain-directed radiation but the impact of subtype on intracranial recurrence patterns after radiation has not been well-described. We investigated intracranial recurrence patterns of brain metastases from breast cancer after brain-directed radiation to facilitate subtype-specific management paradigms. We retrospectively analyzed 349 patients with newly diagnosed brain metastases from breast cancer treated with brain-directed radiation at Brigham and Women’s Hospital/Dana-Farber Cancer Institute between 2000 and 2015. 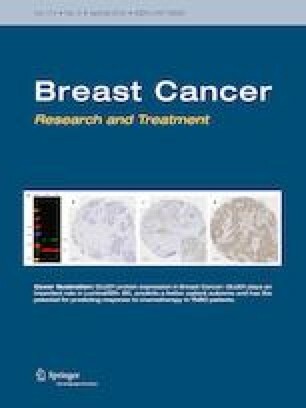 Patients were stratified by subtype: hormone receptor-positive/human epidermal growth factor receptor 2-negative (HR+/HER2−), HER2+ positive (HER2+), or triple-negative breast cancer (TNBC). A per-metastasis assessment was conducted. Time-to-event analyses were conducted using multivariable Cox regression. Of the 349 patients, 116 had HR+/HER2− subtype, 164 had HER2+ subtype, and 69 harbored TNBC. Relative to HR+/HER2− subtype, local recurrence was greater in HER2+ metastases (HR 3.20, 95% CI 1.78–5.75, p < 0.001), while patients with TNBC demonstrated higher rates of new brain metastases after initial treatment (HR 3.16, 95% CI 1.99–5.02, p < 0.001) and shorter time to salvage whole brain radiation (WBRT) (HR 3.79, 95% CI 1.36–10.56, p = 0.01) and salvage stereotactic radiation (HR 1.86, 95% CI 1.11–3.10, p = 0.02). We identified a strong association between breast cancer subtype and intracranial recurrence patterns after brain-directed radiation, particularly local progression for HER2+ and distant progression for TNBC patients. If validated, the poorer local control in HER2+ brain metastases may support evaluation of novel local therapy-based approaches, while the increased distant recurrence in TNBC suggests the need for improved systemic therapy and earlier utilization of WBRT. Daniel N. Cagney and Nayan Lamba have contributed equally to this work. The online version of this article ( https://doi.org/10.1007/s10549-019-05236-6) contains supplementary material, which is available to authorized users. Daniel N. Cagney is a recipient of research support from NH Theraguix. Paul Brown reports personal fees from UpToDate (current) and personal fees as DSMB member Novella Clinical (2016) outside the submitted work. Dr. Leone reports that the institution (University of Iowa) received research funding from Merck. Dr. Leone reports funding from Kazia, Lilly, and Seattle Genetics. Daphne A. Haas-Kogan is advisory board member for Cellworks and reports clinical trial support from Novartis. Dr. Lin reports research grants from Pfizer, Genentech/Roche, Novartis, Seattle Genetics, and consulting fees from Pfizer, Genentech/Roche, Novartis, Seattle Genetics, Daichii, and Puma. Dr Alexander reports personal fees from Foundation Medicine, AbbVie, Schlesinger Associates, Bristol Myers Squibb, Precision Health Economics; grants from Puma, Celgene, Eli Lilly outside the submitted work. Dr. Aizer reports research funding from Varian Medical Systems and consulting fees from Novartis. The remaining authors declare no conflict of interest.